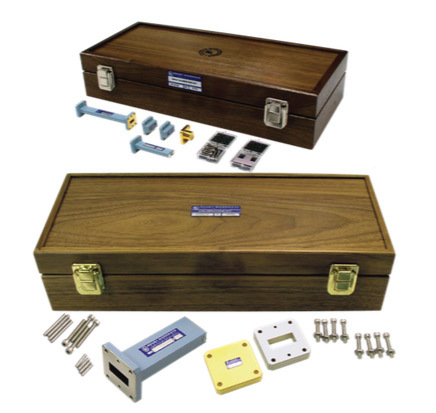 The CK10/12 SSLT Waveguide Calibration Kits are designed to provide accurate calibration of vector network analyzers (VNAs) that are used for measurements in standard rectangular waveguide from 2.6 to 50 GHz (WR284–WR22). Each kit includes all the components needed for accurate calibration of most VNAs to ensure high effective directivity after calibration. Maury CK30/32 calibration kits are designed to provide accurate Thru-Reflect-Line (TRL), Short-Short-Load-Thru (SSLT) and Offset Load calibrations of vector network analyzers (VNAs) for measurements in rectangular waveguide from 2.6 to 50 GHz (WR284 to WR22). Each kit includes all the components needed for accurate TRL, SSLT or Offset Load calibration of supported VNA models. * Precision straight sections and a fixed (reference plane) short are also provide as verification standards in the CK12 or CK32 options. These kits are configured for use in performing one- port SSL (Short-Short-Load) calibrations for measuring VSWR/ Return Loss, or full two-port SSLT (Short-Short-Load-Thru) calibrations to perform forward and reverse transmission and reflection measurements. These kits are configured for use in performing full two-port TRL (Thru-Reflect-Line) and SSLT (Short-Short-Load- Thru) calibrations; two standard methods for measuring forward and reverse transmission and reflection measurements). They can also be used to perform Offset Load calibrations on VNAs that support that calibration method. * Included in the K, Q, U and J band kits only. ** Included in CK12/32 kits. SSLT CALIBRATION KIT w\ VERIFICATION STD. TRL CALIBRATION KIT w\ VERIFICATION STD.